Remember hearing the band that changed your life for the first time? Nada Surf's singer and guitarist Matthew Caws does. As Nada Surf impressively marks its 25th anniversary this year, FUV wondered just how much the revered Boston quartet played into the New York band's backstory. 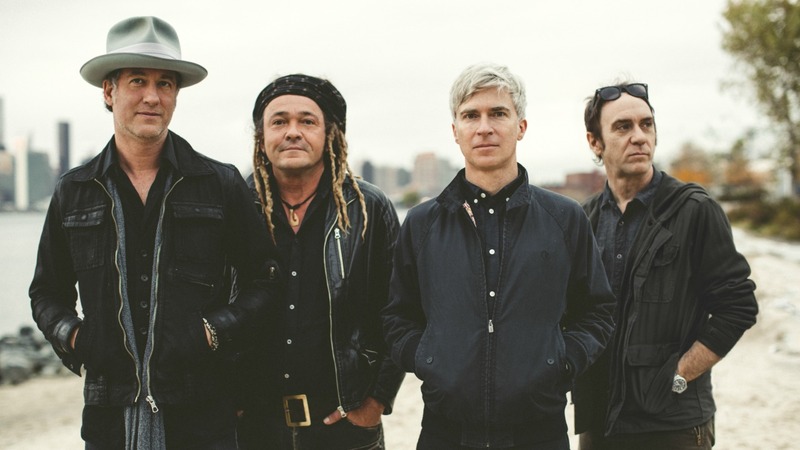 The affection that Nada Surf has for their forebears is evident: recently, their astute 1999 cover of Pixies' "Where Is My Mind," through the magic of savvy sync deals, made its way into a Samsung Galaxy commercial. But as we swiftly discovered when we asked Caws to rustle up his "Five Essential Pixies Songs" for FUV Essentials, Pixies matters to him more than we imagined. Caws not only cobbled together a list of the Pixies songs he loves, but the B-sides, live shows, and bonus tracks that that rocked his world. After reading Caws' eloquent dissection of Pixies' "Bone Machine," you'll never hear the song in the same way again. As a bonus, Nada Surf joins Aimee Mann for the best cat-loving single and video of the year: in May, the band released a digital single for kids called "Meow Meow Lullaby" (complete with an adorable, kitten-abundant video). The track originally appeared on 2004's For The Kids Too, a collection that benefitted the Lili Claire Foundation which helps children with neurogenetic birth conditions. This is the first song of theirs I heard. My childhood friend, Melissa, played it for me on her Walkman. It sounds corny to say that I've never been the same since but it's true. At 21, I'd been actively devouring music for years, nurturing obsessions with everything from R.E.M. to the Soft Boys, the Who and Echo & the Bunnymen. With an older sister deeply into new wave and post-punk; a brother-in-law into the Kinks, the Hollies, and garage punk; parents into baroque classical and the background of disco and the Talking Heads on New York radio, I was a fortunate kid for sure to be exposed to so much. But could something seem totally new after all that? I've since come to understand the the miracle of pop music is that it feels like it reinvents itself again and again and, if it doesn't, I love that illusion and am nurtured by it. But still, in this case, I think the Pixies really did reinvent it. I was electrified and kept asking Melissa to rewind the tape. Most rock songs are "in four." This means we count four beats in every "bar." Think of Paul McCartney shouting, "One, two, three, four!" at the start of "I Saw Her Standing There" and just keep counting. Pixies drummer David Lovering starts "Bone Machine" alone, playing the snare drum on the first and third beats of every bar (skipping the first one to be tricky); it's the exact opposite of what is typically played in most rock songs, where the snare falls on the second and fourth beats. Because we're so used to hearing it the normal way, that's what we choose to hear, willfully forgetting where Lovering started his count, because there's no context telling us otherwise. When Kim Deal's bass sneaks in, she doesn't give the game away; her part is interpretable whether flipped or straight. But when Black Francis' rhythm guitar and especially Joey Santiago's brilliant hook come in, they instantly define the beat, leaving no doubt about where the emphasis is: on the first and third beat of every bar. This turns our perception of the song's rhythm upside down instantly. It's not destabilizing, because Lovering and Deal were setting you up for it, but it is glorious in its revelation. In 1978, ten years before the release of Surfer Rosa, the Cars, another Boston band, put out their eponymous first album. Two minutes and eleven seconds into the first single, "Just What I Needed," drummer David Robinson reverses the roles of the kick and snare, inverting the beat. They only hold this flipped beat for eight seconds, and nothing else about the song changes. It's subtle but incredibly effective. "Bone Machine" keeps this up for three minutes. The rambling speech in the song's verses pull you just far enough away from pop's usual framework of couplets and sections for the return of Santiago's riff on the chorus to re-reveal the inversion even though it never left. They never pull the rug out from under you—they just keep turning the rug around, or you around on it. Oh, and the lyrics are awesome. Black Francis and Kim Deal's harmonies sound as haunted (in a good way), wild and expertly tossed-off as X's John Doe and Exene Cervenka. One more thing about Joey Santiago's riff. It's like slow-motion Chuck Berry: a call-and-response between a dyad (a pair of notes played simultaneously) and a bent-string melody. It evolves four times over four bars, but it's the way that the dyad changes subtly every time that really pays off. Like pure lemon juice, it's challenging and surprising and sweet, making your head tilt just so. This song, written when Black Francis was 15, was considered too normal by the band. Nicknamed "the Tom Petty" song, it nevertheless manages to sound otherworldy, proof that his lyrical stamp will subvert any cruise down the middle of the road. Also proof that Pixies as a group had just as distinctive a stamp when playing almost straight. This song's indignance at the damage we are doing to the natural world is ramped up by its ultra-dramatic counting: "If man is five/then the devil is six/and if the devil is six/then God is seven." "God" is screamed, of course, for extra majesty. This can be enjoyed equally by atheists and believers. Black Francis (real name Charles Michael Kittridge Thompson IV with the post-Pixies stage name of Frank Black), not a believer, has said that he wanted Doolittle to feel like an opera about the Bible. Gil Norton produced Doolittle and applies the same string-section savvy here that he brought to the above-mentioned Echo and the Bunnymen's Ocean Rain. Magnificent. I'm not sure what describing these songs will do at this point. I've already tested your boredom with the mechanics of one song. A few groups have been the Beatles to me, every member seeming unique and essential and whole feeling/seeming/being (in the ear of the listener) miraculous. That feeling lasted for years with the Pixies. For my money, this trask has the best outro on record. And I love outros. There are so many good ones in the world (another favorite: "Black and White" by the dB's). Black Francis has said this is about the Rosicrucians. I never knew what it was about. Sometimes it just doesn't matter. In some ways I don't feel like I completely understood the Pixies, but I think a good goal in life is to try and spend a lot of time around things you don't quite understand, that seem just out of reach. Gorgeous melodies and outer-space pop arrangment. Some druggy cool for you. Kim Deal came off like a good witch. Smiling, spooky, mysterious. She had other songs, like "Gigantic" and "Silver," but this one feels in retrospect like the seed of the the Breeders. "Do the manta ray/Your head can go real screw/With saucers chasing you/Dance the manta ray" Those are all the lyrics. Three chords, hypnotic beat. All you need in this case. My girlfriend and I were on vacation. Unbelievably, we won tickets to this on the radio. There was no opening band. They were absoutely incredible and played a very long show. The sun was still up when we came out of the club. I was very excited for this one. He came out with his Telecaster and a Marshall amp and basically played a Pixies show. Loud and screaming. Some of the songs were from the yet-to-be-released Trompe Le Monde. I wish I had a recording that night's "Planet of Sound." The album version is wonderful, but solo electric it was bonkers. My first band, The Cost of Living, opened for them in Syracuse on the Doolittle tour. I was nervous meeting Black Francis, sharing a table while I was changing strings. I told him about seeing them in Paris. He said, "The thing about the French is that they are so French." We recorded a cover of "Where is My Mind" 19 years ago for a Pixies tribute album. Samsung picked it up out of nowhere and used it in a commercial this year. "Bird Dream of the Olympus Mons"